Qur’an Reader is an application that helps people to read Quran every day. It contains all you need about Holy Quran Parts, Surahs, Pages, and Reciters. You can save multiple bookmarks. You can add many bookmarks as you need, edit, update and delete bookmarks as you need. Qur’an Reader will remind you to read Quran on every day on the time you specify for your daily reading session. Qur’an Reader will remind you to read Surah Al Kahf every Friday on the time you have provided. Qur’an Reader is made from Mushaf Al Madina with Uthmanic Drawing. Qur’an Reader Bookmarks display the part that this bookmark is in, Surah name and page number. 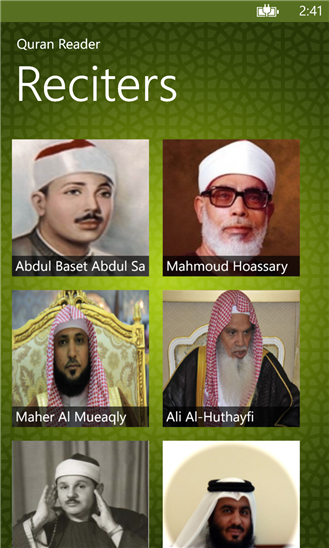 From Qur’an Reader Reciters, you can stream the reciting for free or you can purchase it for offline reciting. Once purchased you can download it also on Windows Phone without any other payments. Qur’an Reader saves and loads the last page you read, so you can continue reading easily. The Reading Page Tile display the last reading page information like Part, Surah name and page number. You can search for Surah from the Search Charm and provides you with search suggestions. Qur’an Reader roams your settings so that you read Quran from you laptop and stop at a certain page when you open Qur’an Reader from your Desktop it will sync your last reading page and all of your settings. 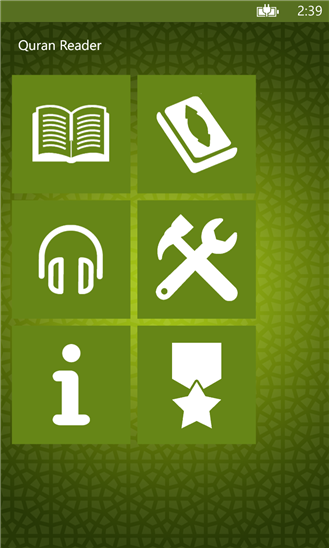 With Qur’an Reader you can share where you are reading now to Facebook, Twitter, LinkedIn and Windows Live social networks. Free Reciting Streaming, or Purchase for offline streaming. Made from Mushaf Al Madina with Uthmanic Drawing. Reminds you to read Quran on every day. Remind you to read Surah Al Kahf on Friday. Saves and loads the last page you read.